Reason For Differences Between Original & Final CCD: Contract Modifications added at the user’s request. Additional time required to repair the 1999 hurricane damage. This marine construction project involves the demolition and total re-construction of a 26,000 square foot marina complex constructed entirely on pilings. The new facility consists of a 19,200 square-foot ship store, boathouse complex constructed on a grid of pilings and girders over water at an average depth of ten feet. The marina complex also includes two floating dock structures with seventy-two boat slips offering utility pedestal hook-ups. The ship store houses administrative offices, training facilities, male/ female showers, and retail sales services. The boathouse provides shelter for canoes and sailboats offered for rent to boaters. New work under this contract includes site work, concrete, asphalt repair, new wooden pilings, docks, framing, siding, doors & windows, roofing, finishes, telephone, plumbing, HVAC, electrical, etc. Area Of Performance: All work (except pile driving and pile removal) has been performed “in-house” by TJC personnel, including (but not limited to) painting, plumbing, HVAC, and electrical. 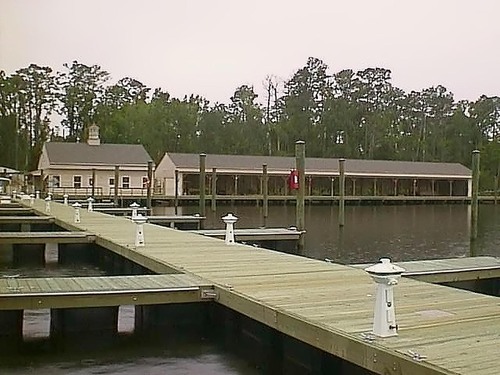 Design-Build / VECP: Camp Lejeune accepted a VECP submitted by TJC Engineering to re-design the floating docks and offer additional features at a reduced overall cost. The new laminated dock design offers a quieter, more stable structure with improved utility access. TJC also upgraded the marina utility pedestals at no additional cost as part of the VECP. Special Project Conditions: This structure’s location over water demanded an environmentally safe plan for lead and asbestos abatement during the demolition phase, as well as over-water painting during the construction phase. TJC closely monitored our subcontractor, Lang Environmental during the abatement tasks to assure that air and water contamination did not occur. During the painting phase, TJC avoided environmental contamination by utilizing temporary shields to block over-spray and dripping. Special care was exercised to assure that paint was not spilled in the water below the structure. The specified finish called for a stain on interior and exterior surfaces. Prior to painting the structure TJC personnel test painted several surfaces and discussed the final appearance of the stain finish with the paint manufacturer and the contracting representative to assure that the end result would satisfy the facility user MWR. Quality of Construction Services: The project references will attest to TJC’s quality of construction throughout the project; see Special Project Conditions above. Refer to the VECP above as an example of TJC’s commitment to offer value added engineered services. TJC’s on-site work force responded to warranty issues within the contract requirements. Scheduling: This project was completed on time based on the revised schedule. Business Relations: TJC completed this project without disruption to the day to day marina activity that continued throughout the entire project. Please refer to the attached letter of recognition issued by the contracting officer during the course of the project.